With the latest driver from NVIDIA.com, notebooks with GeForce 8 and GeForce 9 GPUs can enable ‘Graphics Plus’ features such as NVIDIA Physx and make the world of Mirror’s Edge come to life with real affects of wind, objects and weapons impacting real-time game play. A critical element of Adobe CS4 was to capture the enormous power of the GPU. A simple driver update from NVIDIA.com enables an Adobe CS4 digital canvas that is interactive on notebooks with GeForce 8 and GeForce 9 GPUs. Elemental Technologies’ Badaboom is a video transcoding program that converts video files into other formats. With NVIDIA CUDA technology now enabled on notebooks, the conversion process can be done in a few minutes instead of a few hours. With a simple driver download, NVIDIA GeForce-based notebooks are ready for the free GeForce Power Packs, which are compilations of games, demos, and mod packs for the PC platform that allow consumers to experience first-hand new ‘Graphics Plus’ features such as the PhysX enabled levels of Unreal Tournament 3. SANTA CLARA, CA—DECEMBER 18, 2008—Users with notebooks equipped with NVIDIA® graphics processing units (GPUs) now have the added flexibility of downloading upgradeable graphics drivers directly from NVIDIA.com so they can immediately take advantage of new features, improved application compatibility, and performance optimizations. The first graphics driver release from NVIDIA will extend the NVIDIA CUDA™ architecture technology to notebook GPUs, enabling the growing number of consumers moving to a notebook-only lifestyle to immediately experience the wide range of CUDA-based applications—from heart-stopping GPU-accelerated game physics to GPU-accelerated video conversion. GPUs have long been essential platforms for rendering real-time images to computer screens, but software developers and system manufacturers have recently begun using their parallel processing power to deliver a new level of performance for a variety of visual computing applications. The new NVIDIA notebook drivers enable customers to experience the growing number of applications that use the power of NVIDIA GPUs. Video applications such as Badaboom from Elemental Technologies, Power Director 7 from Cyberlink TMPGEnc from Pegasys Software, and TotalMedia Theater from Arcsoft are all seeing significant performance benefits by transferring the workload from the CPU to the more efficient GPU. Distributing computing applications such as Folding@home, Einstein@home, GPUGRID and SETI@home have seen performance improve by orders of magnitude through NVIDIA CUDA technology. Recently Adobe Creative Suite 4 became the latest application to speed up performance and enhance features by moving processing to the GPU. With NVIDIA PhysX™ technology, GeForce® GPUs bring games to life with explosions full of dust and debris, characters that move with lifelike motion, or cloth that drapes and tears naturally. PhysX technology harnesses the power of NVIDIA GeForce 8 Series or higher GPUs, allowing games to deliver 10-20 times more visual complexity on screen. NVIDIA PhysX technology is the development platform of industry leading publishers such as Electronic Arts (EA) and 2K Games and is the physics engine in the blockbuster title Mirror’s Edge from EA. Starting today, customers with GeForce® 8 and 9-series GPU or Quadro NVS-equipped notebooks can download a BETA version of the drivers from www.nvidia.co.in. Customers will be able to download a WHQL-certified version supporting all GeForce 7, 8, and 9 series and Quadro NVS series notebook GPUs early next year. NVIDIA (Nasdaq: NVDA) is the world leader in visual computing technologies and the inventor of the GPU, a high-performance processor which generates breathtaking, interactive graphics on workstations, personal computers, game consoles, and mobile devices. NVIDIA serves the entertainment and consumer market with its GeForce graphics products, the professional design and visualization market with its Quadro graphics products, and the high-performance computing market with its Tesla™ computing solutions products. NVIDIA is headquartered in Santa Clara, Calif. and has offices throughout Asia, Europe, and the Americas. For more information, visit www.nvidia.co.in. Certain statements in this press release including, but not limited to, the impact of NVIDIA GeForce GPUs, NVIDIA drivers, CUDA technology and NVIDIA SLI® technology on notebook customers, the performance and impact of NVIDIA GPUs in distributed computing applications are forward-looking statements that are subject to risks and uncertainties that could cause results to be materially different than expectations. Important factors that could cause actual results to differ materially include: development of faster or more efficient technology; the impact of technological development and competition; design, manufacturing or software defects; changes in consumer preferences or demands; changes in industry standards and interfaces; unexpected loss of performance of our products or technologies when integrated into systems; as well as other factors detailed from time to time in the reports NVIDIA files with the Securities and Exchange Commission including its Form 10-Q for the fiscal period ended July 27, 2008. Copies of reports filed with the SEC are posted on our website and are available from NVIDIA without charge. These forward-looking statements are not guarantees of future performance and speak only as of the date hereof, and, except as required by law, NVIDIA disclaims any obligation to update these forward-looking statements to reflect future events or circumstances. 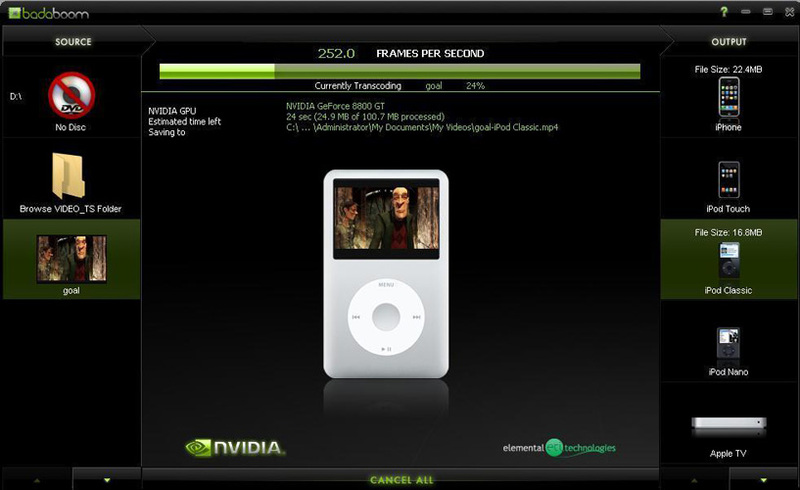 © 2008 NVIDIA Corporation. All rights reserved. NVIDIA, the NVIDIA logo, GeForce, CUDA, PhysX, and Quadro are trademarks and/or registered trademarks of NVIDIA Corporation in the U.S. and other countries. Other company and product names may be trademarks of the respective companies with which they are associated.